A SAINTS DAYS PROCESSION THROUGH THE STREETS OF NEW YORK. NEW YORK NEW YORK USA 1999. A SAINTS DAYS PROCESSION THROUGH THE STREETS OF NEW YORK. THE ETHNIC MUSICIAN'S WALKS DOWN A MIDTOWN STREET. 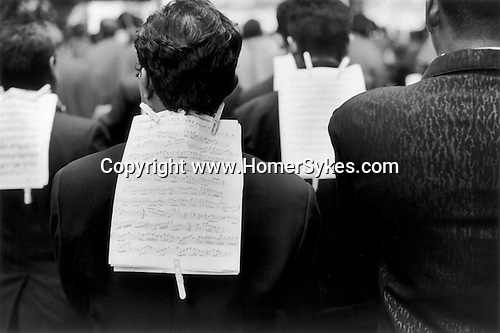 A MUSICAL SCORE IS ATTACHED TO THE JACKET BACK OF EACH MEMBER OF THE BAND WITH CLOTH PEGS.